Freeman makes her world cup debut in the Audi FIS Alpine Ski World Cup downhill races at Lake Louise. 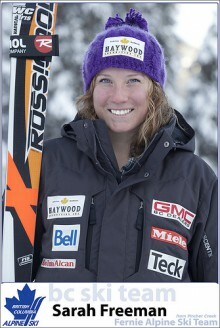 As a proud supporter and sponsor of the Fernie Alpine Ski Team since 1989, Fernie Lodging Company wishes Sarah good luck in the Lake Louise World Cup event and for the 2012 season. Sarah Freeman was a young ski racer from Pincher Creek Alberta when she joined the team three years ago. Sarah did not have access to a program at Westcastle ski area and Chris Slubicki, then President of the Fernie club graciously welcomed her into the local program. Her dedication, athletic skills and work ethic were fine tuned by Rod Timm and his coaches. Sarah performed well, being nominated to the British Columbia Ski Team two years ago and then to the Canadian Team in 2011. When she is not ski racing, she lives and works on the family cattle ranch in the foothills of the Rockies. She does all the “cowgirl” chores including fencing and calving that help prepare for the downhill ski courses of the world.